This post was originally published on PBS MediaShift, Jan. 7, 2011. 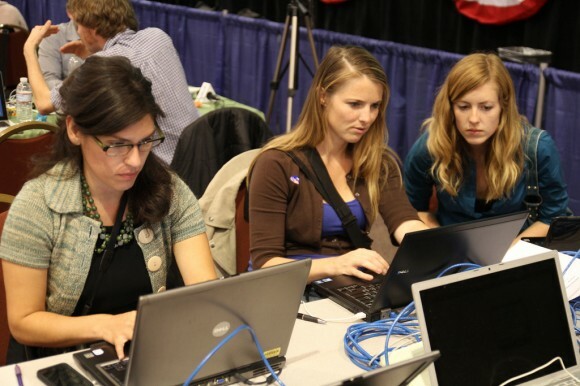 On the right, multimedia journalism students, Christina Maggiora and Andie Adams, work alongside KPBS reporter Ana Tintocalis during election night in San Diego. Doing multimedia journalism and teaching it are two very different things. The past semester marked my first as an adjunct professor. It was probably the best thing I could have done for my own education. At KPBS, I’ve produced online news content using audio, video, photography, slideshows, visualizations, social and interactive media. So when I was offered the opportunity to teach a multimedia journalism course at a local university, I jumped right in. After all, I had already led a number of training workshops. This is going to be easy, right? Yeah, right. In my haste to outline how I would train students in multimedia, I focused more on learning the tools. Of course, the purpose is always storytelling. And my role wasn’t merely to train them to use tools (workshop style) — I needed to teach them how to become multimedia storytellers. Software is temporary; new tools and never-ending feature upgrades require constant learning. I’ve learned my share of dead programs (anyone else remember Authorware?). But regardless of the tools we use, there are core principles underlying how we communicate through different media. I needed to help students adapt to — and thrive in — the change they would inevitably witness during their careers. So how exactly do you teach someone how to learn? Throw them in the deep end. I had to almost force myself not to teach them how to use the software in order to let them to find the answers for themselves. “Ask Google” and “the Help menu is your friend” were mantras of the class. I did give brief introductions to point them in the right direction, but then I let them sort out the details. Screenshot of the Viewer window in Final Cut Pro. Final Cut ProNew to the school’s facilities, I toured the lab to confirm what programs were installed before planning assignments. Final Cut Pro, check. Photoshop, check. Those are key programs, but multimedia projects often require lots of extra apps to get things done (Audacity, SoundSlides, MPEGStreamClip, CyberDuck, etc.). Unfortunately, as is common in academic labs, software requests needed to have been submitted several months in advance; it was too late for me to get anything added. This was a blessing in disguise because limitations can inspire creativity. It also gave me a chance to apply a concept KPBS will be experimenting with in 2011: Using Final Cut as the single program for doing radio, video and audio slideshows. Podcast on multimedia journalism: Use clips from Multimedia Standards, write and record voiceover. 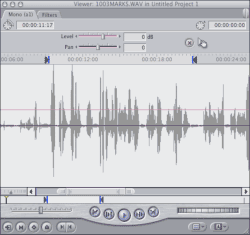 Storytelling through audio: Allow the subject’s voice to tell the story without a narrator. Use sound to create a scene. Storytelling through a still image: Use one image with caption to illustrate a story. Storytelling through a photo series: Create a narrative through a combination of wide, medium, and close-up perspectives. Storytelling through audio slideshow: Combine concept of audio story with narrative series of photos. Storytelling in video: Show action in a series of edited clips to accompany a story. Storytelling through data visualization: Use spreadsheet to graph data, optimized for clear interpretation. Storytelling through maps: Make location-based information useful through an interactive map. My class was small enough to use an approach you would see in a studio art class. I gave a brief lecture on a topic and then gave an assignment. By next class they needed to have work to present. During class, students talked about each other’s work and critiqued what did and didn’t work. By the next class, they needed to have integrated that feedback and have published their final work. This process of seeing work before and after also made for an effective grading practice. It was a clear gauge of effort to see if they incorporated changes. I also wanted them to have the experience of taking feedback, and more importantly, to learn how to give analytical criticism in a productive and professional way. In addition to these projects, I required weekly social media updates: Share a story on Google Reader, bookmark a link on Delicious, and post to Twitter. I’ve spent enough time helping reporters integrate Twitter into their process to be determined not to let my students get by without dominating these elements. Yahoo’s announcement about wanting to sell Delicious underscores the need to focus on the concept rather than the app itself: Track sources, save links and share updates throughout the process. As a sign of success, students are maintaining their updates even after the semester ended. 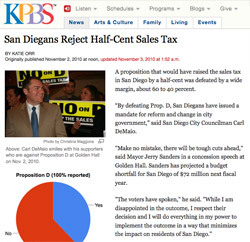 Example of student work published during KPBS election coverage. KPBS Story IllustrationWe were fortunate to have an election during the fall semester, so I took the class downtown on election night. They live tweeted, posted photos of candidates and supporters to Flickr, and published pie charts of election results using Google Spreadsheets. KPBS used the charts online and two students had their photos selected for stories. Students gained practical experience and broader exposure by collaborating with the local public media outlet. By the end of the semester, we were able to have robust discussions about which medium would be most effective for a particular story. And that, in a nutshell, is where successful multimedia stories begin. Teaching as a professional adjunct clarified the distinction between a training workshop and a university course. Workshops are great for quick skill building, but they don’t compare to four months of constant practice, feedback and growth with a mentor challenging you along the way.